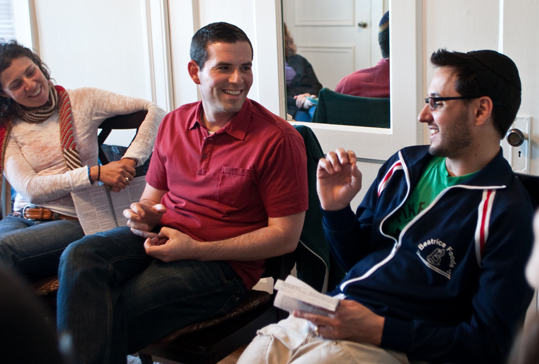 Thursday evenings every other week, a group of six to eight Jews gathers in Ben Ginsburg’s Boston apartment for two hours of socializing and learning. Chips and salsa are set out for the guests, all in their late 20s or early 30s. Occasionally, Ginsburg opens a bottle of wine. Conversation flows easily among this group of friends. Then they settle in for an hour and a half of study. Rabbi Yonah Berman passes out copies of a biblical chapter and a rabbinic commentary that he has selected for the evening. The subject is conflict (between spouses, siblings and larger groups), and the readings come from the book of Genesis, along with an occasional one-page talmudic commentary. Berman offers a few introductory words, and then members take turns reading the text aloud and offering questions or comments. The rabbi functions as a facilitator. The East Bay Chevre Kevah Group, a young adult group in Berkeley, California. 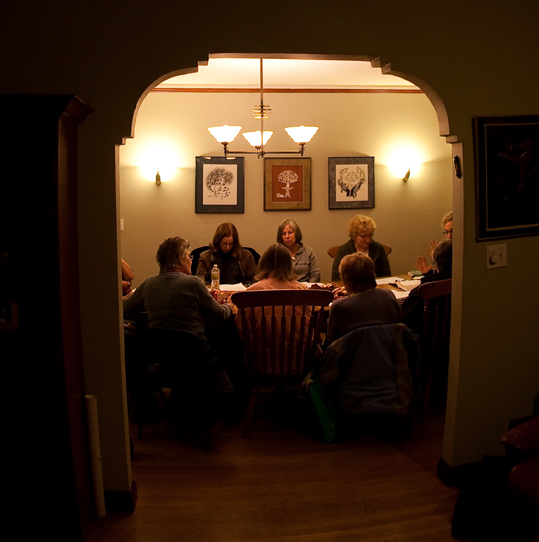 Participants gather for study and community, often in people's homes. Ginsburg’s group is part of a new Jewish startup tailored to millennials that offers a DIY way of engaging with Judaism outside traditional institutions. 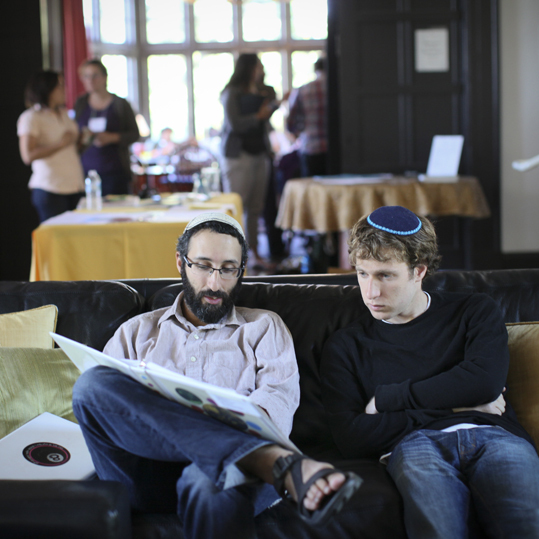 The startup, based in Berkeley, California, is called Kevah (from the Hebrew “fixed” or “regular”), and it helps like-minded Jews create their own learning communities. The only requirement is that group members share an affinity, whether geographic (they live near each other), demographic (they’re in the same age group) or topical (they all want to study a particular subject). Once eight to 16 participants have come together, Kevah will match the group with an educator. The idea of facilitating small group study among unaffiliated millennial Jews speaks to an urgent need. A recent study showed that young people ages 18 to 34 make up 8 percent of the membership of Conservative and Reform congregations in the U.S.
Outside the Orthodox community -- which is much smaller than the other two -- younger adults are largely absent from Jewish congregational life. The 2010 survey, known as FACT-Synagogue 3000, also found that for every 10 young adults in Conservative and Reform congregations, there are 30 adults ages 65 and above. But that doesn’t mean they’re religious dropouts. Bamberger, the founder of Kevah, was herself disconnected after she and her husband moved to Berkeley with their small children a decade ago. Bamberger was in her early 30s. She had grown up Jewish and married Jewish, and had always loved studying classical Jewish texts. But she hit a mental stumbling block each time she thought of joining a synagogue to re-engage with Jewish learning. What if the topic being taught wasn’t interesting? she wondered. Or the teacher wasn’t engaging? Or the synagogue was too far from home? Or the classmates were disagreeable? At last, she came up with an idea. Why not start her own Jewish study group? The group she formed, and another one organized by her brother across the bay in San Francisco, became the nucleus of Kevah, a nonprofit organization she founded in 2010. As a student of religion (and a former program director of the University of California Berkeley’s Religion, Politics and Globalization Program), Bamberger was well aware that evangelicals had fine-tuned the small group model. In fact, she had studied small groups and knew that megachurches relied on them as the basis for fellowship, discipleship, relationship and spiritual growth. She also knew that beginning in the 1970s, Jews had experimented with small groups as part of the Chavurah (Hebrew for “fellowship”) movement, in which home worship groups formed as alternatives to what many saw as stale and soulless synagogue services. Would Kevah's approach of a DIY group combined with a trained educator work in the Christian small group context? Bamberger wanted to draw on the success of the small group model but add a key component: a trained teacher who could provide guidance, giving depth and rigor to the educational experience. The Kevah approach was born. “You can be in a faith environment with friends you love, and there’s access to a fantastic teacher who can challenge you, and there’s discussion based on texts thousands of years old. All of those together make for a rich learning experience,” she said. Studying Torah (and by extension, rabbinic texts) is one of the highest commandments, and among the most elevated activities in which a Jew can engage. But it’s not only children who must study Torah. The obligation extends to adults, too. Kevah Group in Berkeley pore over sacred texts. For Jews of all stripes, Torah study is one of the surest routes to faith formation. And since Jews do not evangelize among non-Jews, group study is also a form of Jewish fellowship. In taking the name “Kevah,” Bamberger wanted to emphasize that study must be a regular practice. “The most profound epiphany needs to be followed up by ongoing intervention to make it endure,” Bamberger said. Kevah encourages groups to stick together beyond a semester or a year; about 30 percent of Kevah groups have been meeting for more than two years. There are now 60 Kevah groups in two cities: the San Francisco Bay Area and Boston. Kevah has a goal of adding 35 new groups a year and plans to expand into Denver in 2016. Yossi Fendel, a participant in a Kevah group in San Francisco. Increasingly, what started as an operation outside mainstream institutions has begun to attract the interest of those very institutions. Last year, Kevah received a three-year, $750,000 grant from the Jim Joseph Foundation. Other Jewish foundations, including the Lisa & Douglas Goldman Fund, the Koret Foundation, the Righteous Persons Foundation and the Natan Fund, have signed on as well with grants to support the initiative. As it spreads across the country, Kevah has also found willing partners in Jewish institutions such as synagogues, Jewish community centers and Jewish federations (coalitions of Jewish social service and educational agencies). That kind of partnership has worked well in San Francisco, where Kevah teamed up with Congregation Emanu-El to launch and support five Kevah groups for its congregants. That doesn’t surprise Spiegel, who studies congregational Jewish life. 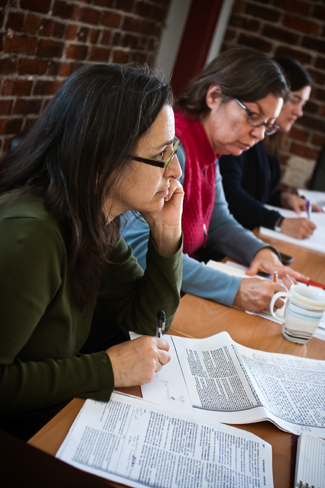 Many synagogues have outdated adult education programs that engage only a small percentage of synagogue-goers. “It’s an old model: ‘Here I am. I’m going to teach you. Come to me,’” Spiegel said. Does your organization expect learners to come to you? How could you adapt that approach to appeal to a broader spectrum of people? And though Kevah was created to reach out to millennials, it has found that older Jews, even Jews affiliated with synagogues, like the concept, too. In Berkeley, a group called “Cool Women,” ranging in age from 60 to 75, has been meeting for four years, plowing through various topics with the guidance of a woman rabbi. In the first year, they examined the work of Maimonides; more recently, they have studied unsung women of the Bible and the weekly synagogue Torah readings. Kevah was created to appeal to unaffiliated millennials, but older, active Jews also have taken part. The Cool Women Kevah Group is an all-women group in Berkeley; its members range in age from 60 to 75. Nearly all the women in this group are affiliated with various synagogues in the Berkeley area, yet the group offers them an added opportunity to engage their faith. Kevah’s singular innovation is the DIY model of Jewish education. Once a group forms, members select from a menu of study topics. In addition to classical texts such as books of the Hebrew Bible, the Talmud or Jewish philosophical writings, groups can choose to focus on so-called “Big Questions,” examining what the Jewish scriptures say about parenting, leadership, or peace and conflict. Or they may decide to study more spiritual topics, such as mindfulness or mysticism. Kevah matches a teacher to each group. It has trained some 25 teachers and has identified 100 others who need no additional training beyond an initial interview and observation. They include rabbis, professional lay educators and academics. Ben Greenfield and Uri Allen confer during the Kevah teaching fellowship. Participant fees are based on how often the group meets, ranging from $320 annually for monthly groups to $960 for those that meet weekly. Need-based scholarships are available. Kevah collects the fees and pays the teacher. It also offers ongoing problem-solving support to deal with burnout, waning interest or difficult participants who may hobble the group’s dynamics. 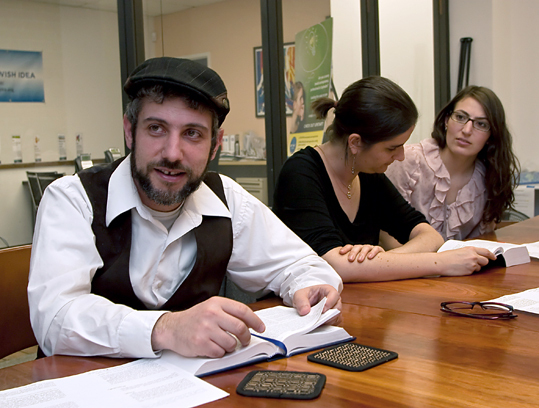 Rabbi David Kasher, Kevah’s rabbinic educator, emphasizes that the point of a group is to give members a chance to engage each other using classical texts as a vehicle. Rabbi David Kasher, center, is the educator for the East Bay Chevre Kevah Group. Meaning making can take many forms: a connection to God, a desire to work for social justice, a commitment to forming deeper bonds of love with other people. “The text serves as that object of reflection,” Kasher said. “It provokes questions and stimulates the learner to add her own answers. Somewhere in the interaction between the learner, the text and the group, energy is created that is generative of meaning. That kind of learning appeals to Korei Klein, a 25-year-old member of Ginsburg’s Boston group. Can Kevah become a model for Jewish community at a time when institutional affiliation is in decline? Jews studying the issue say it’s too early to tell, partly because Kevah is different from older models. If in the past Jews bonded with institutions because they formed friendships through walking together to synagogue or sharing meals on Saturday afternoons, today geographic distances and frequent relocations require other ways of connecting. “If we continue to force people to choose one space or one mindset, they’ll continue to opt out,” she said. Ginsburg, who recently became engaged, is an example of this mindset. He and his fiancee have no interest in joining a synagogue but are attracted to some of the more innovative programs aimed at people their age. Bamberger envisions a time when Kevah groups will provide that kind of social glue for young adults like Ginsburg, even when they take jobs in another city. “Our vision is that ultimately, Kevah will build out a network of Jewish study groups that run like a softball league, so that whenever someone moves to a new city, they know they can connect with a group of like-minded individuals for community building and meaningful conversation,” Bamberger said. Kevah combines a DIY approach with the guidance of a trained teacher. How can your organization appeal to young adults’ flexible sensibilities without losing depth and rigor? Kevah borrows from a Christian evangelical model and applies it to a Jewish context. What unexpected places might you look for new ideas? Are you familiar enough with other traditions to borrow from them? 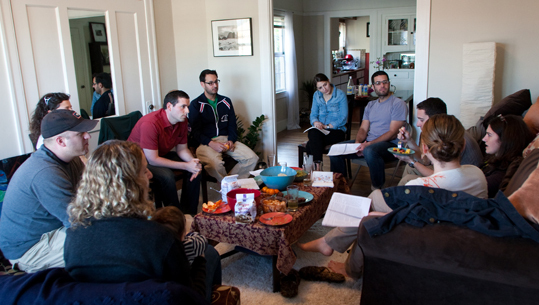 Small groups are a way to bring traditional Jewish study to a 21st-century context. How do you find ways to adapt traditional practices to modern contexts? Although it was designed with young, unaffiliated adults in mind, Kevah’s approach has been embraced by some mainstream institutions. Would people in your organization be willing to seek out partners whose mission might seem at odds with your own? How would you go about finding such partners? Is Rabbi Jessica Zimmerman Graf correct when she says that people today won’t commit to be part of something for 40 to 50 years? If she’s right, what does your organization need to do to engage those people?